Sometimes, we get caught in faith practices and formulas, forgetting that God is always present, in and around us. When we open our eyes and ears to nature; When we hear the cry of the world and respond; Even when we feel burdened by troubles and worries, God is there. Bill Roylance will tell tales he has loved and shared with children and adults for many years. Come, bring your tales of God’s presence in the ordinariness of everyday life. A report about what happened at this meeting: What JOY at last night's interfaith gathering! Bill Roylance opened with Fra Giovanni's "Letter to a Friend" including phrases, "No heaven can come to us unless our hearts find rest in today." and "Take courage to claim the beauty of life." We heard tales of experiences of being touched in unexpected ways by the divine. Some told of feeling true oneness with God in nature or receiving a God-sent solution to a problem. As always, stories triggered stories. One listener asked for the tale of Moses and the Burning Bush. Audrey Seidman gladly obliged. Bill also brought a Rumi poem and Suman Joshi told of an ordinary woman's near death experience, now a national best seller. The evening's full moon reminded Fr. John Waldren of his family's tradition of singing songs of the beauty of the moon! A tale about the FRONT PORCH swaps in Troy and Albany restaurants encouraged a short discussion of how swaps and slams like "THE MOTH" play on NPR. Apparently God keeps us telling our tales to connect to each other across all our lines of difference. Anne Snyder closed with a blessing that we allow all our senses to keep us aware of the beauty and power all around us. We left the building singing, "By the Light of the Silvery Moon," "Shine on Harvest Moon," and "Blue Moon." 6:00 Fr. Gregory invites anyone interested to join his parishioners for Evening Vespers (prayer). 6:40 Fr. Gregory will offer a tour of the sacred space, explaining the "writing" of icons which fill the church. 7:00 Story sharing begins in the community center adjacent to the sanctuary. Fr. Gregory-Francis DeMarais and his congregants are excited to welcome our interfaith tellers for the first time. For about 30 minutes, Fr. Gregory and some congregants will share stories of how their church was founded years ago by Syrian immigrants and how it now includes faithful of Lebanese, Egyptian, Palestinian, Syrian, Ethiopian heritage, and many of Western European descent who have chosen to join the Orthodox Church. St. George's was recently featured in a Times Union article because of our country's connection to Syrian events and refugees. We invite you to bring historical memories of your worship spaces, the journeys your ancestors made to this country or simply memories of the traditions in which you were raised. Reminder: listeners always welcome. You can come for the prayer service at 6, the tour at 6:40, and/or stories at 7. Please join us for what should be a wonderful night of interfaith tale-telling. A report about what happened at this meeting: Some folks arrived for the 6 p.m. vesper service and icon "tour". We learned during the story sharing that some of the beautiful chants were only recently edited especially for our visit. Fr. Gregory-Francis DesMaris and his lifelong friend, Will, worked on chant arrangements they'd long wanted to get to. Eastern chants are more tonal, differing from the Western medieval Gregorian Chants, many associate with Catholic music. You might say these sung Psalms had a more emotional sound. I let words and tunes flow over me as if were at a concert. Fr. Gregory also spoke later of the importance of the painted icons, large and small, which filled the worship space. Many came from his travels to France and Eastern Europe where he studied and ministered before returning to Albany where he'd lived as a young man. The story gathering brought an Ethiopian, Yebza, who was born into a legacy of Orthodox priests and deacons, but who came to college in the US and stayed to work for NY State in finance. 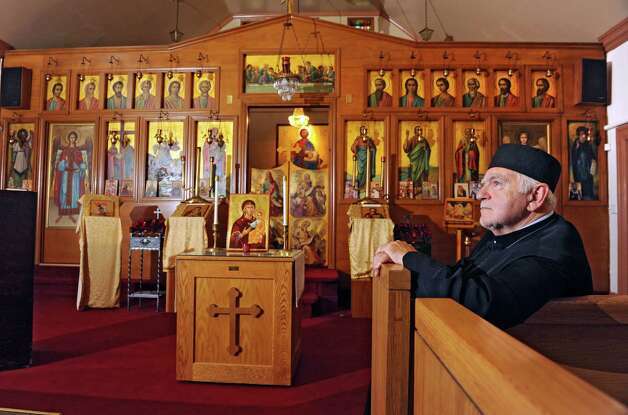 Now, retired, he is a spiritual leader in this vibrant and diverse Orthodox community of Syrians, Lebanese and more. He took us to his Ethiopian boyhood where Orthodox Christians, Muslims, and Jews lived in harmony. And thanks to Sandy Schuman's invitation, we also met Qaadir, a Muslim man now working with boys at Berkshire Farms after years as a prison chaplain for our state. Though raised in Harlem, he too had what felt like an ancient consciousness of how the divine is ONE and yearns for us all to create a community of love. He told of the lessons of an Irish grandmother when Anne Snyder's grandmother memory triggered his, and he shared "story" strategies (quite funny) he offers the boys in his charge, giving them a perspective on the world beyond t.v., the internet, and popular music. Walt Chura's presence drew stories of long-time connections around his spiritual book business, Simple Gifts, which Walt now runs through The Albany Catholic Worker's Emmaus House. We heard many journey-tales throughout the opening introductions, some of which started in the 1960s. It was a treat to have long-time members Judy Lott and Gert Johnson with us as well. I am so grateful for this interfaith circle, a place to share tales that don't always fit on a stage or at a library. Please join us for the 20th Anniversary Celebration (preceded by a vegetarian potluck) which will be held Thursday Nov. 14, Niskayuna Reformed Church Community Center. More details of the evening will follow as it gets closer. Hope you can join us for good food and companionship along with storied memories of our time together or your favorite personal, faith, or wisdom tale. We would like to honor your treasured stories and to listen to small anecdotes/moments that have made interfaith sharing meaningful to you. Tasty, fun, inspiring, prayerful....we promise that’s what this evening will be! Huldah Thompson, our guest storyteller, will take us on journey to Guyana, her homeland. We'll experience her land in all its beauty, gazing at it from a distance then moving inward to the early morning sounds of country life. We'll witness a woman's inner dialogue as she imagines creating meals for a single day - planning her trip to market, and encountering neighbors, spirits and her world. We'll also hear of Huldah's own journey from Guyana to America. When the circle opens for our tales, we might share memories of cultural experiences and our journeys or those of our ancestors to this land. We might tell of people from our past or even how we see our present land through spiritual eyes. Listeners are welcome and whatever story comes up in you as you hear the teller's tale is a good one for telling. So that many can tell, we keep our stories to 10 minutes or under. A report about what happened at this meeting: What a spirited night we had Thursday, December 5, in the beautiful setting of the Unitarian Universalist Society of Schenectady. Storyteller Huldah Thompson brought us out of the cold and into hot, hot, hot temperatures to savor the tropical culture of Guyana. Thanks to Greg Millett of the cable access show Near and Far, this month we have a video of Huldah's opening story, complete with the sound of our circle's delighted laughter. Greg also shared a funny tale of his awakening to the planting of bananas from his time in Nicaragua. Agnes and Hugh Vandever, Martha Thompson and June-Ann Allen brought more Guyanese historical and cultural details to add to the evening's images. BLACK CAKE we could almost taste! Dr. Mussarat Chaudhry connected her Pakistani memories to the evening, and Suman Joshi helped us see Hindu connections in interfaith understandings, since many of Guyana's diverse people originally come from India. Most arrived as indentured servants to work in cane fields when sugar was a leading cash crop. We heard how EVERY culture's and faith-group's holidays are celebrated today in this land of warm and welcoming people. Huldah reminded us of the power of the internet for finding surprising facts about our cultural ancestry and history - details we often cannot hear from family tales. Beth Ares' closed the evening with a touching tale about her adopted daughter from Korea, Heon Jun Lee, who experienced time and again how little Americans know about the differences in Asian nations and cultures. We headed home grateful that through STORIES, we can all become more knowledgeable and more connected across culture and faith. Thanks to Anne Snyder, faithful co-host, and to our videographer from Proctors, Greg Millett. We were also joined by Ann Parillo of the cable show Schenectady Today and of course Huldah, who produces fascinating interviews for the show Impact. Stories and Song from a Variety of Religious Traditions Great for families with school age children! The Abrahamic family has crystallized mainly into three religious communities -- Judaism, Christianity and Islam. Our Tent of Abraham series began in 2006 when we celebrated the confluence of our holy days with stories from our faith traditions. Now, in our ninth year of coming together, we will share stories about the healing power of forgiveness. Everyone is invited to share your own stories of forgiveness (from scripture, history or life experience) as well. All storytellers and listeners are welcome! Additional programs will be announced soon.